What can the moles on a woman's body reveal about her hidden personality? Have you ever wondered why you have moles on a certain part of your body? Why those parts specifically? Maybe there's some secret meaning to it. #12 Mole on the forehead. Chinese astrology thinks of a mole on the forehead as a sign of prosperity. However, it also has an additional meaning depending on the mole's exact position. A mole on the left side of your forehead can sometimes denote a lack of luck in life. It doesn't mean that everything will go your way. Just that you'll have to go the extra mile to get what you want. If your mole is located in the middle of your forehead, it represents your wisdom and can be a sign of a successful marriage. It's also a sign that you'll spend a lot of your life communicating with authorities. Be it your parents or superiors. A mole on the right side of your forehead shows that you're big on partnerships and can be a good companion for both business and marriage. #11 Mole in or near the eyebrows. Moles in the eyebrow can be found very rarely. But if you have one you can be proud of its meaning. It's a symbol of your intelligence creativity and artistry. It also hints at possible wealth and fame. If your mole is located under your eyebrow it represents your good health. A mole above the eyebrow, on the other hand, shows that you may face misfortune because of an unpleasant situation with family or friends. You may also be unlucky with money. Those with moles near the eyebrows are natural-born leaders. They have no problem being in charge and love it a bit more than others. Not a bad quality to have right. #10 Mole on the nose. A mole on the nose often indicates a person with major self-respect, who's not afraid of hard work. In some situations and circumstances, these people can have quite a big ego. At the same time, they're good friends and sincere individuals. If you have a mole on the tip of your nose, it means you're short-tempered. You calm down very easily but you can also regret saying something before thinking it through. A mole on the right side of your nose represents your passion and a constant search for a closer connection to other people. A left-side mole is often a sign of a decent amount of struggles you may face during your life. But at the end of the day, you'll overcome everything and find your happiness. #9 Mole on the cheek. If you see a person with a mole on a cheek or you have one yourself. You can be sure that it represents an introverted and sincere person. Even though these people can be very sensitive they change completely and act with exceptional courage in times of danger. They can also be physically gifted to the point of choosing a job connected with sport becoming an athlete for example. A mole on the right cheek denotes a caring person who puts family above all. If your mole is on your left cheek you can sometimes come off as arrogant because of your introverted nature. Try to be more open to new people and allow yourself to experience life more boldly. This will bring more bright colors into your everyday life. #8 Mole on the lips. A mole near the lips has always been considered incredibly appealing especially for women. It adds an undeniable charm and feminine energy to any appearance. But is its meaning as elegant as the mole itself? The short answer is "yes". If your mole is on the right or left the corner of your upper lip it indicates your desire to get the best from life. You enjoy adventures and good times with friends and you realize that it's your job to make your life amazing. You're also a big food lover. A mole on your lower lip is a sign that your children will be highly successful at what they do. So, you'll definitely be a proud mommy one day. Also Read:Why Are Rolex Watches So Expensive? #7 Mole on the chin. People with moles on their Chin's are affectionate, caring, stubborn and determined. They are realists and are usually ready for every outcome when trying something new. According to Chinese astrology, because of the Chin's constant movement, these people easily fall in love with traveling. They often feel the need to move to another city or country and start afresh. The side of the chin on which your mole is located is crucial too. straightforward blunt and brutally honest person and many people love you for it. #6 Mole on the ears. In Chinese astrology, the ear represents a person's character. 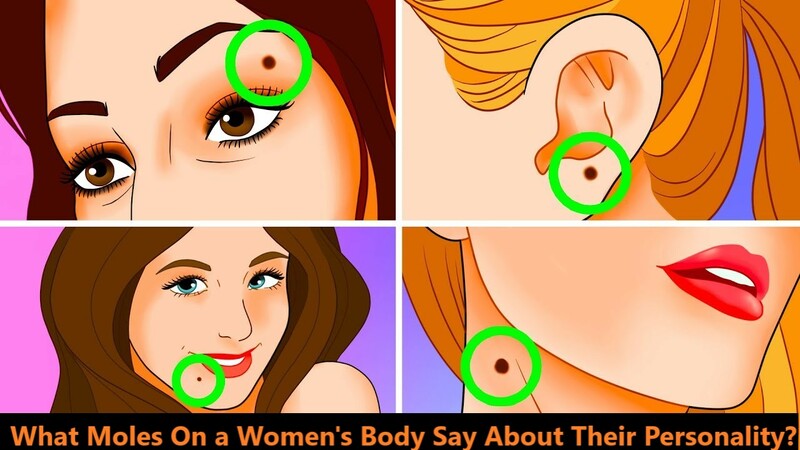 So, if you have a mole on your ear it's a sign that you have an outstanding personality. You're trustworthy loyal and have a good and kind heart. A mole on your earlobe in its turn is the sign of a prominent prosperous and rich life. If your mole is located inside your ear it symbolizes your exceptional intelligence. You may not know everything about the world but you're incredibly witty and learn very quickly. Having moles on both ears is a good sign too. It's basically a promise of an easy and happy life so be sure to enjoy it to the fullest. #5 Mole on the neck. In general, a mole on the neck can indicate that you have a strong but lovable personality. You can easily attract people just by being yourself. That's a natural charisma right there. However, it has another meaning to it as well. In Chinese astrology, if the neck symbolizes a connection between the head and the body. The mental and physical spheres of life. The mole on the neck is believed to interrupt this energy and to be a sign of possible disappointment. If your mole is located in the middle of your neck. It can also reveal that you like to walk on the wild side. Because of your temper, it may be hard for you to find common ground with your family. If this sounds like you try to be more patient and listen to your loved ones more. They only want the best for you. #4 Mole on the shoulder. A mole on the shoulder highlights responsibility in your character. You aren't afraid of a task and can handle any challenge coming your way. This can quickly turn against you. As you're the ultimate problem solver and people aren't shy to take advantage of this. problems aren't worth your time. Don't forget about yourself your own life and personal struggles should always be at the top of your list. #3 Mole on the fingers. In this case, everything depends on the finger and more specifically the part of this finger. If you have a mole on the upper part of your thumb it indicates your decisiveness and strong mind. A mole in the middle of the thumb symbolizes your love for family and your desire to create your own family. law-abiding or you like to challenge the authority of the law. A mole in the middle of your index finger is a sign that you're very competitive and enjoy being on the winning team. If you have a mole on the lower part of your index finger you can be really possessive and even controlling in your love relationships. Okay, now it's the middle fingers turn. Moles on the upper part suggest that you have a strong moral compass and that you'll never act against your principles. A mole in the middle part is a sign of responsibility and of how much you value interpersonal relationships. And those with moles on the lower part of their middle finger are true realists. Who see, life as it is and always apply logic when making decisions. Now it's time for those with moles on their ring fingers to listen up. If yours is located on the upper part you're very artistic. You express your emotions through art and you're certainly very good at it. A mole on the middle part of the ring finger represents glory. You're a highly ambitious person and you want to be the best at whatever you do and something tells us it won't be a problem for you to achieve whatever you want. A lower mole is a sign of your emotional expensable. Finally, it's time for that cute little finger. A mole on the upper part of it represents your love for performing. You enjoy catching people's attention and entertaining others. Those with the middle mole usually stick to planning and don't feel content when they have to go with the flow. A lower mole represents good research abilities. Moles on the palm are believed to have a very romantic history and purpose. Legend goes that they signify the promise of a previous life. To put it simply the lovers of a previous life promised to continue their relationship in this life too and decided to use a mole on the palm as a keepsake to find one another. So, if a mole on your right palm overlaps with a mole on the left palm of another person and vice versa. It means that you were lovers in your previous lives. After all true love always finds a way. #2 Moles on the arms. Some of us have not one but multiple moles on our arms that can become something interesting if you connect them. According to Chinese astrology, these moles often represent a decisive and well-rounded person. You aren't afraid to make a mistake you are afraid of missing the opportunity. That's why you always try to take the bull by the horns and get to the action. have you as you're a person who can not only comfort others but also inspire them and give good advice. So, keep your head high and stay awesome. #1 Mole on the breasts. Chinese astrology considers the breasts to be a symbol of power. So, a mole on this body part suggests a successful career and quick recognition for all your hard work. And it's good news for you since you most probably love to lead a calm life with no worries whatsoever. However, your biggest flaw is your laziness. If you fight to overcome it, you have a good chance of leading a luxurious life that many dreams of. If you have a red mole on your chest don't worry it's a great sign. It represents passion, generosity and a good and loving relationship with your future children's. Such a mole is basically a promise that you'll become one of the best moms ever when the time comes. So, did your description match your personality? Tell us in the comment section below. If you love this article, share it with your friends and family. So, they can find out more about their character as well. If you want to spend more time on our blog do subscribe to our blog.